I am in the midst of reading your book How to Say Anything to Anyone, and I wanted to let you know that I really enjoy your candid yet professional style. Customers provide us with clear feedback. They hire us, or they don’t. They return our calls, or they don’t. They refer others, or they don’t. Unfortunately when customers are dissatisfied, they don’t tell us. They vote with their feet. 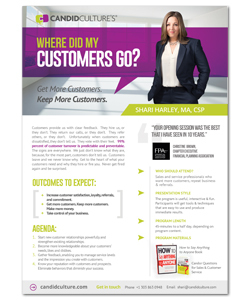 99.99% percent of customer turnover is predictable. The signs are everywhere. We just don’t know what they are, because, for the most part, customers don’t tell us. Customers leave and we never know why. Use our corporate sales speaking to truly understand what your customers need and why they hire or fire you. Never get fired again and be surprised. Sales and service professionals who want more customers, repeat business and referrals. Our business sales speaking program is useful, fun and insightful. Participants will get tools and techniques that are easy to use and produce immediate results. 45-minutes to a half day, depending on program content.